Deepavali is one of the most popular and glamorous festivals celebrated by more than eight hundred million Tamils the world over. This festival is celebrated by Tamils in a bid to get their spiritual needs fulfilled and to enjoy happiness in their secular lives. It’s purely a religious festival, but it also provides opportunities for jubilation and a sense of togetherness in performing religious rites. Although it’s a Hindu festival it isn’t confined to Hindu Tamils, but is celebrated by many people regardless of religious, social, and ethnic differences to ward off the darkness of evil and to welcome the light of fortune and prosperity. The festival marks victory over evil. This fact is established from a story in Purana. Demon king Narahasura had amassed a lot of power and strength by praying. This power and strength had been used by him not for good and virtuous acts, but for acts of evil. Instead of good and virtuous activities he caused untold harassment and misery to his subjects. He was arrogant and tyrannical. Even Devas and Deities could not bear the suffering caused by evil acts of king Narahasura. They prayed to Lord Krishna to destroy the evil acts and to protect the people by liberating them from the wicked hands of Narahasura. It is said in the scriptures that when unrighteousness was predominant the merciful Lord manifests himself on earth to fight for righteousness and to save the world from being destroyed. In answer to the prayers Lord Krishna appeared with his consort Satyabama and killed Narahasura. This is called Narahasura Sanharaya. In his death bed Narahasura repented and was regretful about his wickedness and begged the Lord that the world celebrates his death which was the end of a reign of terror and the victory of good over evil. According to legend this is how the Deepavali festival came into being. Since then it has become an annual celebration which falls due on the fourteenth day of the dark half of the month of Aippasl. In the eve of the festive day Hindus clean their houses and take a ritualistic bath early in the morning. In India the ritualistic bath is bathing in the Holy River Ganges – the sacred Ganga. They call this bath “Ganga Snana”. They believe that they are immensely blessed with this bath as the filth of evil is washed away from their bodies. They wear new clothes and sing the glories of the lord. After that they engage in prayers at home and in temples. It is the belief of Hindus that the oil lamps lit by them on this holy day will burn evil and reduced it to ashes. They believe this act will bring fortune upon them. Thus this is a festival of illumination. 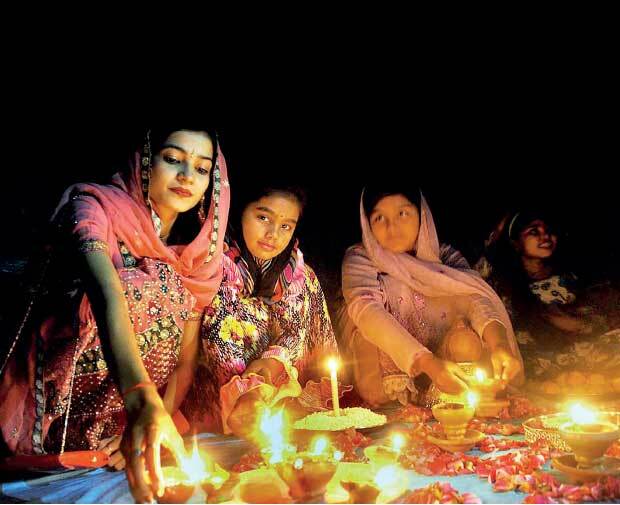 In the evening of the festive day they light the oil lamps to invite the blessings of Goddess Laxmi. Lighting crackers in the evening is a common practice. Deepavali is a festival celebrated with eminent faith and spirit in Sri Lanka. It isn’t only the Tamils in the North and East who partake in the celebrations, but also those who live in every nook and corner of the country. They celebrate the occasion with eminent faith and sanctity. They make figures out of crystal sugar, which take the place of sweets. Their neighbours, friends and well-wishers belonging to other communities share the feelings of joy and togetherness. Deepavali is an age old tradition in Mauritius. This is a significant festival for natives who believe that Deepavali had been celebrated even long before the return of Rama from a fourteen-year exile and his coronation as the king. In that country the festival is marked by lighting earthen lamps in rows. Figures are made out of these rows of lamps. Goddess Lakshmi is worshiped as the Goddess of wealth and crackers are lit to scare away evil. In Nepal Deepavali is known as Tihar. As is done in most parts of India Deepavali is celebrated in Nepal in honour of the Goddess of wealth Goddess Lakshmi and the God of prosperity, Ganesh. In this country the festival continues for five days. The first day is set apart and is dedicated to cows with the belief that Goddess Lakshmi arrives on a cow. People cook rice and feed the cows. The second day is dedicated for dogs believing that the dog is the vehicle of Bhairava. On this day delicious food is prepared especially for dogs. On the third day the entire surrounding is illuminated with lights and Deepavali lamps and some special items of food are prepared. Fireworks, oil lamps and crackers are lit widely during the celebrations. The fourth day is dedicated to Yuma, the Hindu God of death. Devotees pray to this God requesting for long life. The fifth and the final day is Bhagya Day which is dedicated to bless sisters with prosperity and long life. In Japan Deepavali is celebrated in a unique way, different to that of India. Here the people go out to orchards and gardens taking with them lanterns and banners made of cloth and paper and hang them on branches of trees. People sing songs and dance throughout the night. They wear new clothes on this festive day and go boating. They sweep and clean their abodes and decorate their places of worship with beautiful wall paper to usher in the festive mood and honour auspicious beliefs related to the festival. In Thailand Deepavali is known as Lam Krilangh. Devotees light Diyas or the lamps made of Banana leaves. These lamps with candles lit in them are floated in rivers. They put coins in these Diyas and burn incentive which produces a sweet smell. This produces a wonderful view when hundreds of thousands of Diyas are floated in rivers. People greet each other and exchange wishes of happy returns on this day. They also offer sweets to friends, neighbours and well wishers. In the Island of Bali in Indonesia, Deepavali is celebrated in a grand scale as the majority of the population in this island is of Indian origin. Deepavali is one of the most revered festivals in Bali. Rituals followed by the Hindus in this country are mostly similar to those followed by their counterparts in India. In Malaysia Deepavali is known as Hari Deepavali. In this country the South Indian tradition of oil bath precedes the festival. They also visit temples and pray at their homes. Small lamps made of clay are filled with coconut oil and are lit on the Deepavali Day to illuminate the places of worship and individual residences. This festival is celebrated in most parts of Malaysia and the traditions followed are mainly those followed in the Indian sub continent. Hindus in Malaysia invite Malaysians and Chinese residents to their homes on festive day presumably to build a sense of togetherness. In Britain it’s in the cold, damp and windy season that Deepavali is celebrated by migrant Hindus from India and other Eastern countries. In spite of snowy and cold weather Deepavali is celebrated in a grand scale as Indians are the second largest ethnic minority in Britain. Deepavali is marked by visits to local temples and shrines of Goddess Lakshmi. They share sweets, burn incense sticks and light oil lamps to illuminate their homes and the surroundings with Deepavali Diyas and blow the conch shells which is followed by prayers. In Britain rituals are followed in Lakshmi temples. Nearly one hundred thousand Indians who have settled down in Australia make Deepavali a grand festival in that country. Although the unavailability of appropriate material is a problem for Hindus in Australia they manage to celebrate the festival by giving it some modernity, substituting electricity for traditional oil lamps. South Africa has nearly one million immigrant Indians concentrated in the Eastern region. Most of them are from Gujarat and Tamil Nadu. Hence, celebration is more or less the same as that in India. Deepavali is celebrated in many other countries such as Netherlands, Canada, Myanmar, Singapore, Trinidad and Tobago and United Arab Emirates’. As mentioned earlier Deepavali is celebrated to invite the blessings of Goddess Lakshmi, provider of peace, prosperity, fertility, beauty, fragrance, wealth, love and many other virtues. Goddess Lakshmi possesses compassion, satisfaction or content and impassiveness or stoicism and is the wife of god Vishnu, who is a Bodhisattva and one of the triad of Hindu Gods. Hence it’s believed that Goddess Lakshmi is capable of and is anxious to bless devoted Hindus. Peace which is the need in many parts of the world, including Sri Lanka, is a by-product of love, meaning not the Valentine day love, but spiritual love. Peace and love should be achieved through non-violence. Hatred is never appeased by hatred itself. “Nahi verena verani”. This is the eternal law which should be emphasized on the Deepavali festival day when all of us strive for non-violence, peace and prosperity. We have the brilliant light of the sun and the mellow light of the moon and stars. Deepavali symbolizes an age old Hindu culture which teaches us values and directs us on to the path that dispels ignorance and drive away darkness, that engulfs the light of knowledge. Deepavali is the festival of light and has huge importance even in today’s modern world. The principles and rites related to Deepavali teach us to uphold the true values of life which shouldn’t be darkened by “Raga” carnality, “Dwesha” hatred and “Moha” ignorance, but should be brightened through the four Brahamanic behaviours, “Metta” Friendliness’, “Karuna” compassion and “Mudita” satisfaction and “Upekkha” impassiveness. Let us hope that the hearts of every one will be illuminated with the brilliant light of the sun and the mellow light of the moon and stars and specially with the light of lamps lit on the Deepavali day!